This past week has been a whirlwind of work, numbers, maths, students, low bank balances and procrastination. Slightly tortured by all this craziness, I decided to take a few hours out of my day yesterday and do something I wanted to do. 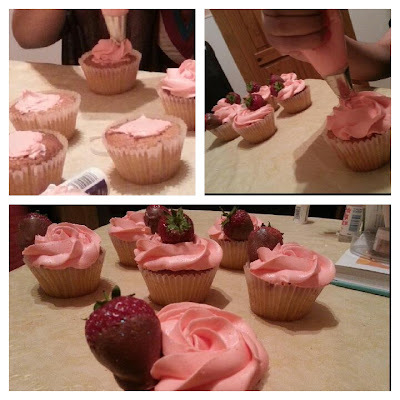 These are vanilla cupcakes with strawberry icing and a chocolate covered strawberry on top. PS. CAN I HAVE ONE? THEY LOOK DELICIOUS! p.s. I've nominated you for a blog award. It is enjoyable to me.